El-Beblawi is a renowned economist and also a co-founder of the Egyptian Social Democratic Party. He served as undersecretary-general at the UN between 1995 and 2000 and was the minister of finance in Essam Sharaf's cabinet from July to October 2011 during Egypt's post-revolution army-administered transitional phase. He resigned in October 2011 to object to clashes in Cairo's Maspero district between military police and Coptic protesters in which 28 of the latter were killed. Born in 1954, General Abdel-Fattah El-Sisi graduated from Egypt's military academy in 1977. He went on to serve in the mechanised infantry, specialising in anti-tank warfare and mortar warfare. In 2008 he became the commander of the northern military zone in Egypt. When the 25 January revolution erupted in 2011, General El-Sisi was head of military intelligence as well as the youngest member of the Supreme Council of the Armed Forces, the body which went on to rule the country until presidential elections in June 2012. In August 2012, Mohamed Morsi appointed El-Sisi minister of defence to replace Field Marshal Tantawi. On 1 July 2013, the Egyptian armed forces, headed by El-Sisi, delivered an ultimatum to political groups in Egypt, requesting that they solve the ongoing political deadlock within 48 hours or face an army-imposed roadmap. On 3 July, El-Sisi declared on television that President Morsi had failed Egyptians and that he was no longer president, to be replaced by the head of the Supreme Constitutional Court. El-Sisi maintained that the army was acting solely to preserve Egypt's national security. General El-Sisi currently enjoys a significant level of popularity among different classes and groups in Egypt, although the Muslim Brotherhood accuse him of leading an illegitimate coup against Morsi. Nasserist Hossam Eissa is a political analyst, law professor and former head of the steering committee of the Constitution Party, which he co-founded with liberal figure Mohamed ElBaradei. He resigned from the party in March in the face of apparent internal divisions. Eissa earned his doctorate from the Sorbonne in France and taught at universities in Cairo, Algeria and Japan. He also worked as a legal consultant to several regional and international entities such as UNESCO. Eissa has been politically active since he was a student and is a former member of the Nasserist Party’s political bureau. Bahaa El-Din is a lawyer and a founding member of the Egyptian Social Democratic Party. He was a member of the now-dissolved 2012 parliament, having won a seat in Assiut. Bahaa El-Din received his bachelor's degree in economics from the American University in Cairo in 1987 and a bachelor's in law from Cairo University in 1986. He later received a doctorate in financial law from the London School of Economics, and worked in various parts of the Egyptian state bureaucracy. From 1997 to 2000, Bahaa El-Din was a senior legal advisor to Egypt's economy ministry, and from 2004 to 2007 he was chairman of the Egyptian General Authority for Investment and Free Zones, a governmental entity concerned with regulating and facilitating foreign and domestic investment. He was initially among the names being suggested for the premiership in the first post-Morsi cabinet, but his selection was opposed by the Nour Party. Ex-army officer Fadel held a number of posts at Egypt’s state-owned airline EgyptAir, including vice chairman. He holds a bachelor’s degree in aeronautical engineering from Egypt's Military Technical College. He also has a diploma in management from the American University in Cairo. He joined the Egyptian Air Force in 1972 as an aircraft maintenance engineer and went on to hold several executive maintenance, engineering and logistics positions until he became vice president of safety and quality in 2001, two years before joining EgyptAir. Adel Labib, 68, served as governor in several Egyptian governorates under Mubarak, including Qena in Upper Egypt, Beheira in the Nile Delta, and Alexandria. There were major protests against him in Alexandria with some local groups accusing him of mismanagement during his term. However, in 2011 he was made governor of Qena for a second time by prime minister Essam Sharaf after protests by locals demanded that Labib be appointed in place of an unpopular alternative. Labib continued to serve as Qena's governor until the June 2012 governor reshuffle under then-president Mohamed Morsi. He was succeeded by Salah Abdel-Meguid, a 52-year-old expert on environmental affairs. El-Borai served as minister of manpower under Egypt’s first post-revolution prime minister Essam Sharaf in March 2011 until he was replaced in August 2012 by the Muslim Brotherhood’s Khaled El-Azhary. He is also a founding member of the Constitution Party. The law professor, who holds degrees from the universities of Cairo and Paris, succeeded in June 2011 in removing Egypt from the International Labour Organisation’s "short-term" blacklist, partly through his decision that Egyptian workers would be free to establish and form independent trade unions, a significant advance for workers rights. His decision, however, was not enacted by parliament and Egypt was consequently put back on the ILO blacklist. As an expert in labour relations, he played a prominent role in drafting the unified labour law of 2003. Galal, who holds a doctorate in economics from Boston University, has been the managing Director of the Economic Research Forum (ERF), a Cairo-based leading non-governmental research institution covering the Middle East, since 2007. Under the Morsi regime, Galal participated in an economic development initiative launched by former prime minister Hisham Qandil in December 2012 which aimed to tackle Egypt's economic challenges through a series of "societal dialogues" between various societal and political factions. Galal is described as a "non-partisan proponent of the importance of growth with equity as well as the vital role of politics for sound economic policies." Under his leadership, the ERF launched new research on economic inequality, natural resource management and labour and human capital development. Before that, Galal was a researcher with the World Bank for 18 years, where he served as industrial economist for Europe, the Middle East, and North Africa, economic advisor at the private sector development department and finally as adviser on the Middle East and North Africa from 2006 to 2007. A prolific writer, Galal has authored and co-authored over a dozen works on privatisation, regulation of monopolies, trade, monetary policy and fiscal policy. The prospective minister was also the Executive Director of Research of the Egyptian Centre for Economic Studies (ECES), another independent think tank, between 2000 and 2006. Imam was appointed by ousted president Morsi and will continue in his post. He started his career as an engineer at the Aswan High Dam power plant, then moved to West Delta Electricity Production Company where he worked until 2002. He was then appointed head of the Cairo Electricity Production Company until 2011. After the 25 January revolution, Emam was appointed deputy to the Minister of Electricity. He was appointed to the ministerial role by Morsi in early 2013. Criticisms arose lately after recurrent electricity blackouts over the past two months. In June, Emam said that Egypt's current electricity-generating capacity now exceeds national consumption. He called on citizens to continue cooperating with the ministry by decreasing their electricity consumption. El-Araby served as Egypt's Minister of Planning and International Cooperation from August 2012 to May 2013 under Hisham Qandil. He was replaced by Muslim Brotherhood figure Amr Darrag in a May reshuffle. An economist by training, El-Araby received his doctorate from Kansas State University in the United States. For the majority of his career, he worked at the country's National Planning Institute. From 2006 until the end of 2011 he headed the technical advisory office of the former planning minister, Fayza Abul-Naga. After a brief interlude, during which he worked at the Arab Planning Institute in Kuwait, El-Araby was called back to head the ministry. El-Araby was a key part of the Egyptian team negotiating with the International Monetary Fund to obtain Egypt's long-awaited $4.8 billion loan and is expected to take up this role once again. Helmy was originally appointed as minister of communications and information technology in January 2013. He resigned from the cabinet on 1 July in protest at ousted president Mohamed Morsi's failure to respond to nationwide protests against his rule. A graduate of a military technical college, Helmy obtained a diploma in computer science from Ain Shams University in 1979. After leaving the army in 1983, he began his career in the civilian IT sector, working in several Egyptian and multinational corporations including Oracle Egypt, where he became managing director. Abu Hadid was first appointed agriculture minister in former prime minister Ahmed Shafiq's cabinet which was formed during the 18-day January 2011 uprising. He continued to serve as minister in the following cabinet under former prime minister Essam Sharaf. He was replaced as minister under former prime minister Hisham Qandil in 2012. Sharaf El-Din is the first woman to take on the role of information minister. The information ministry has long faced criticisms that it is used as a tool by the government to control the media, and many calls have been made to abolish it since the January 2011 revolution. She has also hosted several television shows including Sual (Question) on a state channel and Ahl El-Raey (People of Opinion) on privately-owned Dream channel. Sharaf El-Din was also a member of the policies committee and the women's committee of the former president Mubarak's now-dissolved National Democratic Party. Zaazou, 59, continues in his post as tourism minister, which he held in the previous cabinet. In June, Zaazou resigned from his post in protest at the appointment of a member of militant Islamist group Al-Gamaa Al-Islamiya as governor of Luxor. However, Zaazou withdrew the resignation later and continued as minister after the governor resigned. 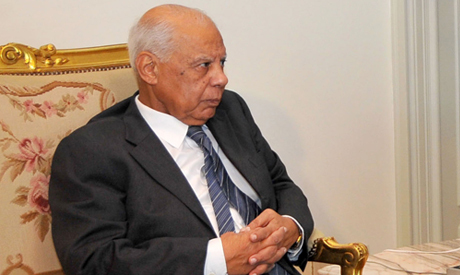 Mehleb headed the public Arab Contractors Company for 11 years before resigning in September 2012. He was originally appointed by Mubarak-era minister of housing Ibrahim Soliman, currently in jail pending trial on corruption charges. Under Mehleb's leadership the company carried out major construction projects in Cairo including building major bridges. He graduated with a degree in engineering from Cairo University in 1972. Abu-Eita is president of the Egyptian Federation of Independent Trade Unions (EFITU). Since Morsi's ouster, he has been openly supportive of the "30 June revolution" and has called on members of EFITU to end labour strikes. He is the general manager of the Giza Real Estate Tax Authority. He is one of the founders of the pan-Arab Karama Party and is founder and president of the independent union of Real Estate Tax Authority employees. Abu-Eita is known for leading the formation of the first independent trade union, the independent general union of Real Estate Tax Authority employees, in 2009, after leading the Tax Authority employees’ national strike in 2007. He fought to split from the official state-backed General Union of Banking and Insurance Employees to which the Tax Authority employees belonged. After the ouster of Hosni Mubarak, Abu-Eita was offered the post of minister of manpower by Yehia El-Gamal, deputy prime minister in Egypt’s interim government, but he declined the offer. Abu-Eita was also an MP in the now dissolved 2011 parliament. In the 2011 elections, he together with other Karama candidates ran on the Muslim Brotherhood-led Freedom and Justice Party list. Abu-Eita was born in 1953 in Cairo’s Bulaq district. Abdel-Aziz was the head of the Shooting Club, a private sports club in Giza, and then became chairman of the National Council of Youth. He is a member of the Egypt Party, founded and presided by Islamic moderate preacher Amr Khaled. Abdel-Aziz was also the director of the 2006 football African Cup of Nations, which Egypt hosted and won. He was nominated by Khaled Talimeh, a famous political activist and a member of the Popular Current. Talimeh will become the vice minister. Iskandar is the chairperson of CID Consulting (Community and International Development Group) that works with garbage collectors in Cairo on environmental initiatives such as recycling. Rabat is the head of the public health department at Qasr Al-Aini Medical School at Cairo University. The first woman to hold this position, she graduated from the faculty of medicine at Cairo University in 1982. According to news reports, state body the National Council for Women nominated Rabat for the ministerial position. Some activists such as Mamdouh Hamzah have accused Rabat of being complicit in the privatisation of public hospitals during the Mubarak regime. He is currently a faculty member of Cairo University’s mechanical engineering department. Abu Shadi, a police general, was formerly the senior interior ministry official responsible for investigating supply crimes. Abu Shadi also served as the head of the internal trade sector in the Ministry of Trade and Industry under Rashid Mohamed Rashid, the last trade minister under ousted president Hosni Mubarak. The new minister is in charge of distributing state-subsidised food and fuel. One of his biggest challenges will be to put an end to the chronic fuel shortages that Egypt has been experiencing in recent months. An international judge and a prominent lawmaker, El-Mahdy, 77, is a member of the advisory committee of the Cairo Regional Centre for International Commercial Arbitration (CRCICA) and the National Human Rights Council. Graduating with a degree in law in 1956, El-Mahdy started out as an associate in the technical office of late Egyptian president Gamal Abdel Nasser, and later became an advisor to the justice and finance ministers. Over his extensive career, El-Mahdy has assumed several leading judicial posts. From October 2000 to September 2001, he chaired the Egyptian State Council and the High Administrative Court. He was the only Egyptian judge to serve as member of the International Criminal Tribunal for the former Yugoslavia, the body is tasked with prosecuting crimes committed during the wars in the former Yugoslavia. In 2007, El-Mahdy was selected by the United Nations Secretary General Ban Ki-Moon to be member of the United Nations-backed tribunal trying suspects in the 2005 assassination of Lebanese prime minister Rafiq Hariri. Following the January 25 revolution, El-Mahdy served as member of a national fact-finding committee tasked with investigation into violations that took place during the uprising. His post – minister of transitional justice and national reconciliation - is a new role, replacing the old position of minister of justice. Ibrahim was the minister of antiquities in the cabinet under ex-prime minister Kamel Ganzouri in December 2012, and continued in the role under the premiership of Hisham Qandil until May 2013. A professor of antiquities at the faculty of arts in Ain Shams University, Ibrahim has many critics among Egyptian archaeologists and Egyptologists, including the employees of the ministry. A webpage representing employees of the antiquities ministry announced their rejection of Ibrahim's selection and their plans to go on strike and stage a sit-in, without specifying a time frame, in front of the ministry building in Cairo's Zamalek district to prevent Ibrahim from entering. Critics of Ibrahim say that during his tenure he failed to address ministry corruption, did not provide temporary ministry employees with permanent contracts, and allowed the situation of Egypt’s antiquities to deteriorate. In May, he received a two-year prison sentence for "refusing to implement a court ruling" of paying a fine to two political prisoners who were released. However, Ibrahim appealed the verdict, won the case, and remained minister of interior. He was born in 1939 in Qaliyubia governorate, and earned his bachelor’s degree in 1965 in Arabic studies, he later completed a master's and a doctorate. Mohamed Saber Arab is a history professor at Al-Azhar University. He was head of the Egyptian National Library and Archives from 2006 until May 2012. He was appointed Minister of Culture in May 2012, succeeding Shaker Abdel-Hamid. Arab resigned from the post in June to be allowed to win a state prize for social sciences worth LE200,000, which sparked controversy at the time. Arab was not the first choice for the role of culture minister; the job was first offered to Ines Abdel-Dayem, former head of the Cairo Opera House, who turned it down. Abdel-Nour is one of the ex-ministers that claimed to have been offered and refused a ministerial position under recently ousted president Mohamed Morsi. He is currently secretary-general of the National Salvation Front, Egypt's main opposition bloc under Morsi’s regime. The 68-year-old politician served as Egypt’s tourism minister from February 2011 until August 2012 under the cabinet of Essam Sharaf, the first post-revolution prime minister. At the time secretary-general of the Wafd Party, he was the first minister from an opposition party to hold a cabinet post for 30 years. The Coptic minister is also the founder of the Egyptian Finance Company and was a member of the National Council for Human Rights. He also sits on the board of directors for the Egyptian Federation of Industries and the Egyptian Competition Authority. Fahmy, a former Egyptian ambassador to the US, will assume the role of foreign minister in place of Mohamed Kamel Amr who has been in the post since July 2011. Fahmy, who is dean of the School of Global Affairs and Public Policy at the American University in Cairo, was Egypt's ambassador to the US from 1999 to 2008. Previously, he was the country's ambassador to Japan from 1997 to 1999. He also served as the political advisor to Egypt's foreign minister from 1992 to 1997. The career diplomat worked extensively on issues of Middle East peace and regional disarmament. Fahmy was born in New York in 1951. He received a bachelor's degree in physics and mathematics and a master's in management, both from the American University in Cairo. Saleh served as investment minister from August 2012 to May 2013 in the government of ousted president Mohamed Morsi. He was then replaced by Yehia Hamed, a spokesperson for the Muslim Brotherhood's political arm, the Freedom and Justice Party, from which Morsi hails. Born in 1960 and a graduate of Cairo University's faculty of commerce, Saleh served as chairman of Egypt's General Authority for Free Zones and Investment (GAFI), a governmental entity concerned with regulating and facilitating foreign and domestic investment, from 2009 until his instatement as minister. Saleh told Ahram that he accepted the ministerial post offered to him by interim Prime Minister Hazem El-Beblawi after former tourism minister Mounir Fakhry Abdel-Nour turned it down. Saleh said that despite the "difficult time" the country was experiencing, he would complete the mission he had begun while in office, in particular by encouraging investment. Saleh said he is confident that the general climate in Egypt will attract investments once the situation settles down, referring to ongoing political unrest in the wake of Morsi’s ouster. Born in 1963, George graduated from the faculty of agriculture at Cairo University in 1984. He pursued an academic career and is a professor at Cairo University. Air Marshall Reda Hafez, 61, has been the commander of the Egyptian Air Force since 2008. He has served in the air force since 1972 and held several command posts over his career. The air marshal is a member of the Supreme Council of the Armed Forces (SCAF), which ruled Egypt from February 2011 to June 2012. Hafez is one of the handful of ministers appointed by Morsi to keep his position in this cabinet reshuffle. Ismail's name was not announced until just before the swearing-in on 16 July. Another name, Mohamed Shoeb, had been circulating as the person expected to be appointed to the ministry. Abu Zeid, 51, was a star of the Egyptian national football team in the 1980s, helping the Pharaohs to win the 1986 African Cup of Nations trophy. He also starred with Cairo-based club Ahly, collecting a large number of trophies and awards. He succeeds El-Amry Farouk in the role of sports minister, who resigned on 2 July. This new cabinet will only further divide and polarized this nation. Exclusion of Islamic leaning figures and Islamist parties will not server any better purpose but more deteriorate the current fragile political situation of the country. Our liberal & secularists friends and Army generals may have lot of disagreements with Morsy Supporters & other Islamist parties but they cannot ignore the fact that a major segment of the society support them. Egypt is not consist of only Cairo & some urban cities, major part of the Egypt consist of rural areas and population having very rigid in Islamic beliefs and they are fully behind the Islamist. Force exclusion of a large segment of society and bring in those who consistently lost in last 5 elections, will only create more hatred and more confrontation. I’m afraid this kind of measures and steps by Army and their supporters make Islamist more stronger in coming elections (if ever held, seems difficult in prevailing state of affairs) and Secularist will again face one more humiliation in elections. Most of the ministers named have excellent credentials and experience. The opportunity exists for this long-suffering nation to undergo a real transformation. But we shouldn't get too hung up on individuals we feel are less suitable than others for various reasons. The fact is that this is an INTERIM government, expected to endure for no longer than a year at the most. The important point now is for everyone to band together, support the president and the cabinet - and work for a better future for all. Tamarod has got that message. I heard a spokesman say yesterday evening that the group is keen to get things moving and won't throw spokes in the wheel by blocking appointments. It is encouraging that members of the Interim Government seem to be very capable in their own fields. Also that this Government is inclusive of qualified members of Egyptian society regardless of gender and religion. Egypt and the Egyptians deserve peace, true democracy, equal rights and prosperity. A long and hard road is ahead but rewards will be considerable make all efforts very worthwhile. Egypt deserves encouragement and loyal support . This is an excellent government formed with very experienced technocrats, the mixture of ministers from different parties is also very good, and we should not worry if any come from the Mubarak era, as we need their expertise, it is about time that we learned from our past mistakes! Hoping this ministry will guide Egypt on it's rightful path to great success! Congratulations! The reality in Egypt today is that Morsi is history. However,I am of the opinion that this new interim government should avoid officials who held office during the Mubarak years. I can see there are technocrats in this new government and do not have doubts that they would do their best to put Egypt where it rightly belongs. I hope to see a strong Egypt where the human rights of all its citizens are guaranteed regardless of their religion. Morsi's officials all finish the Quran only and have beards. That is not giving Egyptians a better future and life.